A harmonious painting by the Spanish painter Juan de Juanes. Strangely enough the faces of most disciples seem to radiate mostly adoration – and this while they have just heard that their master is about to be betrayed. 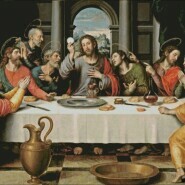 In the front right, the traitor Judas, for better recognition he has been equipped with a money pouch. At a moment when Valencia was becoming a channel through which Renaissance ideals entered Spain, Juan de Juanes and his father were the city’s most significant artists. Born Juan Maçip, Juanes trained and collaborated with his father on some of Valencia’s most important commissions from 1530 until his father’s death in 1550. Despite being strongly influenced by his father, Juanes developed his own distinctive style. His sweeter, gentler approach included clear, luminous tones and softer effects of modeling but displayed less technical detail in finishing. 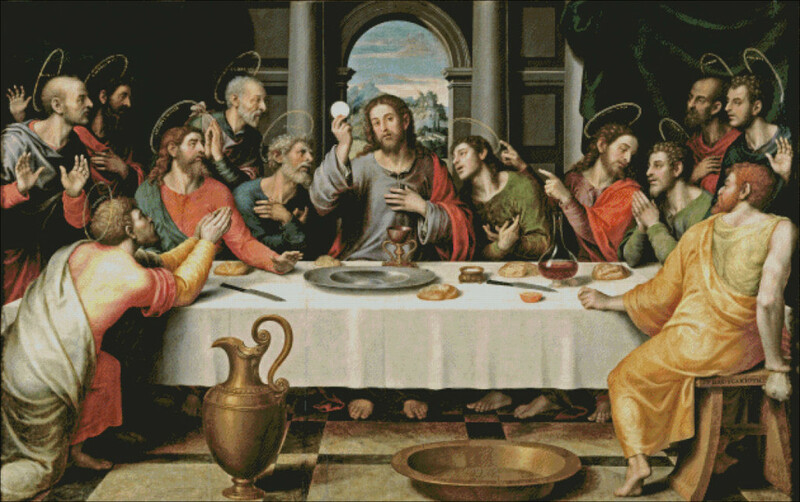 He painted mostly religious subjects, along with mythological works and portraits. A critical moment of Juanes’s development occurred around 1560, when he probably went to Rome. Though many artists and styles he encountered there inspired him, the work of Raphael seems to have exerted the most profound influence. Juanes remained true to his own convictions, but his subsequent paintings displayed an Italian influence. He learned to create drama through facial expression, and his canvases gained a greater sense of movement.